Shopping at a grocery store can be challenging if you have multiple food sensitivities to gluten, casein & soy. Luckily, there is a Gluten/Casein/Soy Free Grocery Shopping Guide that can help. All the information has been re-verified to be gluten-free, wheat-free, casein-free, dairy-free, lactose-free, milk-free & soy-free. It is a must have for a GFCFSF diet!Do you struggle to find products which meet your dietary restrictions? Many people have a difficult time locating food products that are free of gluten, casein and soy, but thanks to Cecelia’s Marketplace Gluten/Casein/Soy-Free Grocery Shopping Guide, you can now go grocery shopping in a fraction of the time. Don’t waste hours reading nutrition labels or calling food manufacturers to get ingredient details. With this handy shopping guide, which fits easily inside your purse or back pocket, you can save time finding the products you want. 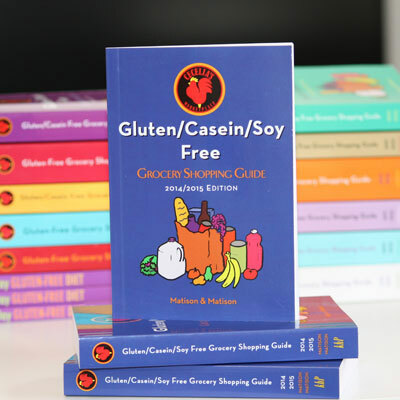 Gluten/Casein/Soy Free products listed in this guide. Products organized by food category. Easily fits in a purse or coat pocket. Cut your grocery time in half. This Gluten/Casein/Soy-Free Grocery Shopping Guide has a convenient index for looking up any product you come across. All of the 17,000 products listed inside are free of gluten, casein and soy. Any gluten-free certified products and items which are manufactured in a dedicated gluten-free facility are clearly marked, accommodating all sensitivity levels. This guide takes the guesswork out of your weekly grocery shopping trips. This handy guide gives you access to information about all of your favorite food brands. Among the thousands of products listed are all the major food brands like Heinz, Kraft, Del Monte and Frito Lay. Products from all the major supermarket chains, like Albertsons, Hy-Vee, Kroger, Meijer, Publix, Trader Joe’s, Wal-Mart, Winn Dixie, Wegmans and more, are listed as well. Thanks to this handy, compact guidebook, you’ll be able to quickly look up the information you need in just seconds.